Christine Sinclair's fabulous year earned another ovation on Wednesday when the soccer star was chosen the Canadian Press female athlete of the year. Little about Christine Sinclair's brilliant performance at the London Olympics came as a surprise to her teammates. But it allowed the rest of the world to finally see the captain they all know so well. The 29-year-old star of Canada's women's soccer team lifted her squad to a bronze medal at last summer's Olympics, Canada's first medal in a traditional team sport since 1936. The result firmly entrenched her as a Canadian sports hero and brought global acclaim to a player who has been among the best women on the planet for years. It also capped a tremendous season that earned the Burnaby, B.C., native the Bobbie Rosenfeld Award as The Canadian Press female athlete of 2012. "She's always been one of the best in the world, she's always been fantastic, and what's great about this year is that the world got to see her at the highest stage — Olympics," said Canada's veteran goalkeeper Karina LeBlanc. "The world was watching, and she showed what we've all known for so long. "People are starting to see all sides of her — her funny side and her humble side. She's a phenomenal athlete. And she believes so much. Playing for Canada is such an honour, and she shows that in the way she plays. She doesn't go out there and talk the talk. . . She shows it in the most beautiful way." Sinclair earned 269 points, including the majority of first-place votes (84), to run away with the award, which is determined through balloting among sports editors and broadcasters across the country. Olympic trampoline champion Rosie MacLennan was second with 118 points ahead of speedskater Christine Nesbitt (76), tennis player Eugenie Bouchard (30) and hockey player Caroline Ouellette (27). "It's a huge honour," Sinclair said, but then deflected praise to her teammates as deftly as she delivers a pass. "I'm proud of our team. We had a goal this year heading into the Olympics and that was to bring home a medal, and we accomplished that and just to sort of see the way Canada fell in love with our team, it's been very remarkable." Sinclair, who has won nearly every athlete of the year award in Canada this month, led her team to bronze in London in spectacular fashion, scoring an Olympic-record six goals to win the Golden Boot. Sinclair recorded a hat trick in a controversial 4-3 extra-time semifinal loss to the U.S., and then lashed out at the officiating, which seemed to endear her even more to frustrated fans watching back home. 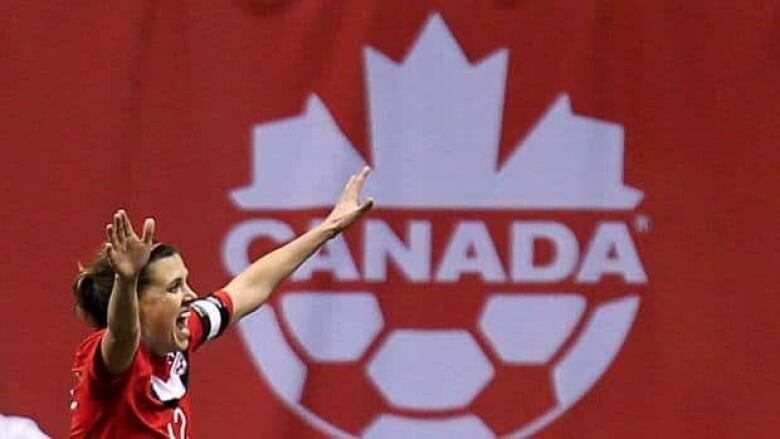 "Christine Sinclair is Canada's best soccer player," said Phil Andrews of the Guelph Mercury. "What a passionate leader. What a clutch performer. What an inspiration to the thousands of youths playing soccer in Canada and dreaming of being a star at an international level. She was the biggest story at the Olympics for Canada this year." Cyclist Ryder Hesjedal of Victoria won the Lionel Conacher Award as Canada's male athlete of the year Wednesday. Sinclair scored a Canadian-record 23 goals in 2012, and added six assists, meaning she contributed to 65.9 per cent of her team's scoring in 2012. Her 143 career international goals rank third all-time. The season was a remarkable turnaround for the five-foot-nine player with the sweet scoring touch. Only a year earlier, Canada was ousted in the preliminary round of the women's World Cup. Coach John Herdman, hired to pick up the pieces after their heartbreaking World Cup result, used a photo of Canada's disconsolate captain, head in hands, her face contorted in despair and dashed hopes, as motivation for his players heading into London. "When you look at Christine's face in that picture, it wasn't just disappointment, it was frustration, it was anguish, it was guilt, it was a little bit of shame as well," said Herdman. "I told them, 'I never want to see a player with this sort of talent with this sort of love for the game feeling like this after any game they play for Canada.' "
He's since added a much happier photo of a crying Sinclair on her knees on the pitch, her arms raised in jubilation after Canada's bronze-medal victory over France. "I emailed that around the team and I said, 'I think we promised we'd make Sincy cry, and this time for the right reasons,' " Herdman said. Sinclair is the first soccer player to win the Bobbie Rosenfeld Award, originally awarded in 1933 and named for the Olympic champion and all-round athlete who was voted Canada's top female athlete for the first half of the 20th century. Herdman compares her to a Rolls Royce — because she's all class. He's said she could be the David Beckham of the women's game because of her smart soccer mind. He likes to tell the story of how when she emails him about a particular trip, she always adds "if selected" in brackets. Sinclair, true to form, heaps all the praise for the team's success this past season on Herdman. "He brought back this confidence and belief within us, and had the veteran players learning new things and excited to play, and we all bought into his system and his style," Sinclair said. One might not think a veteran such as Sinclair would have many new things to learn. But she points to Herdman's "grow room" as an example. A soccer computer lab of sorts with six laptops, players can watch footage of their performance in practice and games. "We've never had that before so you're able to watch every single time, for instance, in practice you are involved in the play, every single time you touch the ball: what did you do with it, what was your pass percentage, how many times did you turn?" Sinclair said. "That's been a big thing for me is watching myself in practice. It's one thing to watch yourself in games, but day in and day out what you do in practice is what makes a difference and we've never experienced that before." Sinclair, who was Canada's flag-bearer at the closing ceremonies, took a month off following London — her longest break from the sport since having mono in 2002. She knows the next three years could be the busiest of her career. Canada will be gunning for gold when it hosts the 2015 World Cup, and then looking for a podium performance — an perhaps a measure of revenge against its American rivals — at the Olympics a year later. She still has to sit out a four-game suspension for a post-game incident after that heartbreaking loss to the U.S. in London. But she will travel with the Canadian team to next month's Four Nations tournament in China. "She's banned from the games in China, but she wants to be in that environment, she wants to be able to support players," Herdman said. "It speaks reams about her. "You get into some of the spiritual and emotional things that Christine brings to the game and I think in a society now where we're challenged with whether we can keep kids active, whether we can actually find opportunities for kids during those troublesome teenage years to stay in involved with sport, people like Christine come along."